This type of wood cutting board is an aesthetic and impressive kitchen appliance with a number of advantages. For many years, was known and used mostly by butcher blockers and a narrow circle of chefs. 1. Do not curve - with proper use and maintenance this type of boards remain perfectly flat because the pressure caused by the change of humidity in the board is inhibited by adjacent blocks of wood that are kept together. 2. Do not dump the knife as fast as the other types of boards - the cutting edge slides between treewoods. 3. It is almost not scratchy and self-healing by scratches - when the pressure is exerted by the knife, tree-like woods (which are like a micro brush) are shifted to the sides and less injured. 4. Wear resistance is much greater than other types of wooden boards. 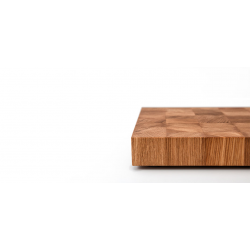 In addition to the advantages of End Grain boards, we can add those of the natural antiseptic (anti-bacterial) properties of oak wood as well as that it is glued with one of the world's best adhesives, especially recommended for kitchen cutting boards. The board is impregnated many times with liquid paraffin and beeswax. Put luxury and comfort in your kitchen with a quality and practical luxury Bulgarian product that will impress. If you want your board End Grain to stay like new for years, have some things to consider. No wooden board is suitable for washing in a dishwasher, impregnate it 1-2 times per month or more, at least in the beginning of use. Good options are liquid paraffin, tuna oil and flaxseed oil (all vegetable oils, olive oil are not particularly recommended, because of their properties to garnish over time, which can lead to a slight tangy smell of the board). After use, the board can be washed with liquid soap, sponge and water and wiped with a towel to dry it off (avoid washing it on tap water for a long time, because this kind of boards are more sensitive of wetting). Because the wood is a porous material, it is not advisable to cut beetroot or other strong dyeing foods, because they will stain the board in depth and then it is very difficult to clean. In case of substantial dirt, it can be treated with lemon juice on a strongly sprinkled salt. Bread soda with little water rubbed in the board, also cleans in depth, removing unpleasant smell. SpecificationsBrand: CHUNCHE - we cut betterType: cutting board END GRAINMaterial: Oak woodLength: 3..
SpecificationsBrand: CHUNCHE - we cut betterType: cutting board END GRAINMaterial: Oak woodLength: 4..